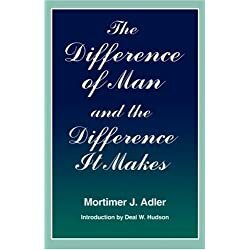 Several months ago I mentioned a book by philosopher Mortimer J. Adler, "The Difference of Man and the Difference It Makes," and noted that we'd be having an online discussion here in the fall. The reprinted edition of this book is offered by Fordham University Press, and most if not all of the book is free here. Since this book addresses Catholic theology, philosophy, emerging computer intelligence, criminal justice and theories of punishment, and animal intelligences--and most importantly, what to make of all these interactions--I thought it would be a good subjection for discussion. Lots of Venn diagrams interacting! If you have been reading this book, now is your opportunity to offer your reactions. Some possible questions to consider: Is free-will talked about enough in society? How important is this concept to our faith? Is there enough awareness of mitigating forces that encroach upon or attenuate free will--internal psychological forces being just one of them? How does the concept of free will fit into philosophies and platforms of the major political parties? Does modern neurology consider free will? Is the practice of the "social sciences" (psychology, economics, sociology, etc.) possible if one of the variables to be considered is free will? Perhaps those of you with expertise in the Catechism or the Compendium can point us to sections of these works that show the importance of free-will in Catholic thinking. I realize that today's readers would expect a title encompassing both men and women, and some will have hoped for copy editing that would equalize the masculine and feminine throughout the book. So this is noted. I look forward to reading and discussing your thoughts and reactions, and will offer a second blog on Wednesday that will continue the discussion. I have not yet read the book, but the topic and I are familiar. Free will explains evil to me to the extent that a person may actualize choice in an environment which is often hostile and overwhelming. Pope John XXIII seemed to me to deal with this concept well when he wrote Mater et Magistra. He presented the faithful with a world in which greed was suffocating justice. The pontiff's remedy was radical and Christlike: nations and people in order to choose the good must choose to share to the extent that there is surplus. This response impressed me because it assumes that free will must be exercised by those with any power to do so on behalf of others as well as oneself. A failure to choose good on the part of those with any option to do good accounts for all that is negative which results from human origin in our environment. Even those acts of nature which cause harm could have been, for the most part, rendered less harmful had individuals acted previously for the good of others AND themselves. Such an approach to free will would surely have hampered economic disasters and the scope and intensity of epidemics. It is sad to me that although I studied Mater et Matistra in high school,my children and grandchildren have never been formally introduced to it. Given that several people have made it through the first 52 pages. I would like to ask whether anyone believes that animals actually have free will - whether to a lesser degree than "man" or not at all. Animals interact with us, and sometimes they initiate the interaction, but do they actually make a choice to do so? I think they are acting on sensations like curiosity, hunger, tiredness, etc. I think that many people, maybe most, most of the time do not engage their free will in determining what they do either. I just want to note that the preview to which you link here only goes to page 52. It is mostly technicalities about what standards should be applied in evaluating claims as to the difference of man from the rest of creation - what the standard should be and why. There is a apparently a lot more in the book that can serve as a basis for discussion about "man" - "Catholic theology, philosophy, emerging computer intelligence, criminal justice and theories of punishment, and animal intelligences". Is there any way to more of this free and online? A couple months ago I downloaded this book for $10 from Barnes and Noble to read on my computer Nook reader and I still have it. And I downloaded it again today but could not find it anywhere in their website. So it is in their database of ebooks at this moment but not listed anywhere on their website. It is a shame since the ebook format has so many advantages. ah, thank God for Fordham Press and paper! Can there even be a "science" of economics with "free will"? Do Republicans consider free-will a more viable concept than Democrats? Have we dminished the importance of free will (and attending consequences) with too many entitlement programs? Bill, why single out economics? Free will is contrary to every science that assumes determinism. Economics is in relatively good shape because it typically concerns average behavior of a group of individuals or firms. It also allows for economic outcomes to change as average preferences change over time. In other words, it is the science of working out what happens when a number of agents (presumably with free will) make certain choices. It can tell you what will happen if people choose A or if people choose B - it doesn't claim that their choices are restricted internally at all. Well, let me throw this out. Human beings can choose to conform to a set of beliefs and change the way they conduct themselves relative to everything else in creation. However, an individual human being is never in control of the reactions he or she encounters in response to his or her choice of behavior. Therefore, even if everyone in a society is on the same page philosophically, there are likely to be interactions which do not conform to expectations, which then leads to conflict, disappointment, or confusion. Everyone has a will free enough to make choices, but typically no one has enough influence to achieve the exact outcome he or she envisions. I have not read anything specifically mentioning free will in those parts of Adler's book that I have accessed, so perhaps we should be discussing, first, what we consider free will to be, or maybe there is a section that gives us a working definition. If not, then I suppose I am suggesting that free will consists of the ability to think about what we do before we do it, as opposed to being free to do whatever we feel like doing when the mood strikes. Thanks for your insights into the book and the time and effort that went into these. Adler has indeed thrown many tiny "bits" into the kitchen sink, many of these philosophical terms that might represent hundreds or even thousands of words each. So there is alot there. We often say "we know by faith" and I have heard scientists step outside whatever their discipline is and acknowledge that there indeed are different ways of knowing reality other than an empirical method, so this intuitive approach holds true for many, and for me, too. Now on the point of free will, Adler is challenging many/most of contemporary thinkers because he does say that the free will in human beings goes beyond biology, neurochemistry, genetic, etc., and he says there is an IMMATERIALIST compnent to our make-up. To back this up he cites philosophers who have taken this view throughout thousands of years and in particular the Aristotelian and Thomistic approach which has been the foundation of much of the teaching of the Church. He says we have a soul or a spiritual component that can't be accounted for by biology. From my readings free will is important to Catholics. This was one of the big issues of the Reofrmation. Are things pre-destined? Or do we work out our salvation daily? Ah, politics, and how the politiicians try to sway our will, or buy it. As they say in Chicago, vote early and vote often. Most neuologists don't believe in an immaterialist free will, as Adler describes it. However, Sir John Eccles, who won the Nobel Prize for exploring synaptic transmission in the brain, was one prominent scientist who did so. A practiicing Catholic, he was fond of saying, "I don't filly understand how the brain works, and I won the Nobel Prize." I'm not a big subscriber to Calvinist thinking, or try not to think so, but sometimes some things seem preordained. To account for this, there are all kinds of theories on past lives, karma, predestinationm metampsychosis. You go into a place and it seems familiar-but you've never been there. You meet someone you think you've known before, but you couldnt have. My own feeling is free will is free most of the time but sometimes something uncanny happens, and it comes from who knows where? My name is Rhett Segall. I teach moral theology in a Catholic H.S. in Troy NY. A difference in degree is ''more'' or ''less'', as humans have more tool making ability than apes. A ''superficial'' difference in kind refers to a critical threshold (such as the change from the liquid state of matter to a frozen state) and then a ''radical'' difference in kind refers to the presence in one being of a principle that is not found in another, e. g. between organic and non organic matter. It's been a while since I read the book (except for perusing now and then) but I think Adler uses these distintions in connection with a phenomenology of free will. For me, the first 52 pages were the most difficult because Adler defined his terms in such meticulous detail. After that it was just plain hard. I'm prejudiced in favor of actual hold-in-the-hand paper books so I am big fan of Amazon for a source of used books. I look forward to being able to follow the discussion. Thanks for having a go at those first pages. I, too, cannot read very long on the computer, there are way too many white pixels interspersed among the black pixels. Nothing better than old fashioned black ink IMHO. A friend tells me that the Kindle and some other readers are not using pixel technology but rather something different where there are not millions of white dots hanging around. So maybe I will try this. Hope you get the book and find some enjoyment in the questions it raises and the other authors it mentions. I haven't read the book yet but I did check the wikipedia page on Adler and saw that he was a Thomist and very influenced by Aristotle ... http://en.wikipedia.org/wiki/Mortimer_J._Adler. The wiki page divides up his idea of free will into three parts - Circumstantial Freedom of Self-Realization (economic, political, external freedom), Acquired Freedom of Self-Perfection (freedom based on personal character), and Natural Freedom of Self-Determination (a natural freedom inherent in humankind). I don't think people have free will to the extent that it can justifiably be used as a defense for why God lets bad things happen - the idea that bad things happen because God deems free will so important in people he will let them do evil. But I do theink they have free will to the extent that they're responsible for their acts. Many interesting thoughts about animals. And even a podcast in this week's AMERICA. The list is long of those who would like to diminish the role of Aristotle/Aquinas on Catholic thinking. I'm not sure that other philosophical systems diverge from Aristotle/Aquinas on this particular issue. A theme of all existentialisms is being through "authentic choice." Teilhard of course wrote about that special moment when something new entered consciousness. He was an is a breath of fresh air, but still within the Thomist camp, methinks. Might we agree that "men and women in their humanity are the only creatures that blog in AMERICA?" Well, there even seems to have been a difference between us and the Neandertal, at least as recent paleoanthropology indicates, a very meaningful difference. Homo Sapiens had an explosion of art and abstract symbolic thinking. Something took off. What was it? Did it happen at the same time as the appearance of Homo Sapiens or later, a kind of singularity or brushfire? HS was around a long time before the explosion witnessed by the cave paintings. Did this type of reflexive thinking, awareness or whatever it was, spread through the human population like a meme? Sometimes I think we make a mistake focusing on this or that attribute defining our uniqueness. Maybe it's something else behind all these things that drives them to greater heights. There seems to be a rudimentary math capability in higher mammals and birds. But what takes off on this base and flies toward algebra, calculus and whatever? Is it just that we're better at math (difference of degree) or is it something else (quantum difference, difference of kind) that interacts with the basic ability and takes off? Notice how many of my sentences were questions. I can't claim to have the answers. I just read about the free will in fruit flies. In Alder's terms, which Rhett summarized well, above, the article would suggest that free-will in humans differs from free-will in other creatures in degree. However, I think it might be possible to say that it is a at least a "superficial" difference in kind, in that the kind of decisions fruit flies make using their version of free-will never has anything to do with abstract ideas or beliefs. I have never met a dog like Lassie from TV or movies, in that if Timmy is in the well, Lassie goes to get help. If anyone else knows first hand of incidents like this, I may change my mind about the following, however, assuming this is pure fiction, it seems that animal thinking is pretty much limited to decisions pertaining to eating, sleeping, and reproducing, while human thinking in response to Timmy's predicament would involve making complex evaluations of the situation in terms of urgency, methods of extraction, obtaining assistance, safety, etc. Humans plan ahead; do animals? I believe some anthropologists attribute the development of artistic and engineering interests in humans to the fact that humans, unlike animals, live in supportive societies. A pack of dogs, to my knowledge, does not specialize in the various tasks involved in hunting or protecting or whatever else dogs do in packs, for example. And, while a hive of bees consists of bees which do specialize in various functions, they do not exhibit any emotional connection to one another - only a chemical one - and they always build the same thing in the same way. Humans are clearly part of the animal world in that all that combines to make a human human exists in some measure in other creatures. However, I sometimes wonder whether a non-human creature gets a sense that there is something going on that it does not quite understand. Do all the other creatures just react to humans like they do to other things in their environment, or do some of them perceive humans to be somewhat inscrutible, the way we sense that there is something going on at another level that our senses and intelligence cannot quite grasp? Norman at #23 above refers to Adler's understanding of God. (I did not see where this was in the parts of the book I could access) I am wondering whether this involves something along the lines of where being able to concieve of the notion of God implies the existence of God. Can we imagine things that are completely imaginary, or does everything we think about have to have a concrete reality in order to make it possible for us to think about it? This seems to be the case in animals, though their upper limit of understanding and caring about it seems to be well below our upper limit. I'd like to comment on Marie's comment-#9 and Bill's reply-#10. .."There are many things that get in the way of how we would like to act, want things to be, or hope they turn out." Most of us can relate to that wisdom in our own lives. An entire genre of music, opera, is often based on that premise. I recently heard opera described as: "man and woman meet, fall in love and then life ...the world...gets in the way." Thankfully, not all human relationships end up, like opera, doomed to tragedy! In fact, some relationships thrive in spite of all that the world throws up against them. What makes the difference? In the tragic examples, free will is thwarted but in the successful ones, free will manages to hold its own. I wonder if the difference is in the Providence of God. How does the Providence of God interact with free willof humans in this particular case of human relationships? I've begun reading Adler and hope I might get some insights from him, you, Bill, and commentators. Or, maybe my question is beyond the boundaries of this discussion!! I think they use a magnetic field sense along with other cues. But I'll leave my old trigonometry book open on the back deck and see what happens. A man sees two buildings, one with the sign ''Determinists' Club'', the other with the sign ''League of Free Will''. He first went into the Determinists' Club, but when asked why he wanted to join it, he replied, ''Because I choose to'' and he was thrown out. He then tried to join the League for Free Will, and when asked a similar question he replied ''Because I have no other choice'' and again he was turned away.